October: The month where early bird shoppers buy Christmas gifts while the rest of us are buying fall stuff for ourselves. Whichever camp you're in, Fresno has a lot going on this month if you like to shop. Aside from the new fall lines now in stock at stores, there's several shopping and fashion-related events this month. If you're into upcycling, secondhand or good causes, you'll especially like the lineup. ShoeBox Sharing fair, Sunday, Oct. 4, noon to 3 p.m. at 1650 W. Roberts Ave. This event at a private home features vendors selling Christmas ornaments, quilts, clothing, jewelry and baked goods, along with Pampered Chef and Jamberry nail wraps. A portion of each purchase benefits ShoeBox Sharing, a nonprofit that provides blankets to local children and Armenian orphans. Artisan Faire at Mia Cuppa Caffe, 10 a.m. to 4 p.m., Sunday, Oct. 18. This monthly event is packed with vendors indoors and out at the coffee shop at 620 E. Olive Ave. Shoppers can buy locally made soaps, baked goods, jewelry, photographs, caramel apples and more. If you're a regular, note the new day and time. 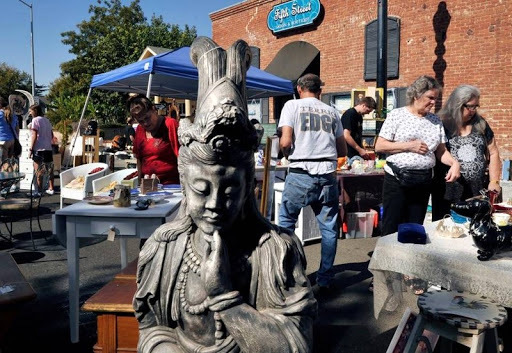 Glorious Junk Days, 8 a.m. to 3 p.m., Sunday, Oct. 18, in Old Town Clovis. This event just keeps growing and now has 150 vendors centered around Pollasky Avenue and Fourth Street. It features repurposed and upcycled items, everything from painted furniture to handmade wall art that you might see on Pinterest.com. Chair caning and wood turning will be demonstrated and those services available for hire. 3 Oaks Studio will also demonstrate furniture painting. The Fall Flea at Yoshi Now! downtown runs from 10 a.m to 3 p.m. Saturday, Oct. 24. The flea market takes over the parking lot with 40 to 50 vendors. "We keep it vintage, antiques, upscale junk or handmade DIY - no new merchandise," says manager Joy Harvell. Expect vendors selling fried chicken and dessert and DJ Green Giant. Yoshi Now! is at 648 Broadway St.
Cirque De Fashion, 10 a.m. Saturday, Oct. 24, at the Fresno Convention Center's Ernest E. Valdez Hall. This fundraiser by the Saint Agnes Women's Club benefits the Holy Cross Center for Women, a downtown day shelter for women that also hosts children's programs. A fashion show with local stores and salons will be followed by on-stage entertainment, including fire acts, acroyoga (acrobatics and yoga), aerial dancing and Mother Ginger, the character in the "Nutcracker" ballet who has a skirt giant enough to hide several children under.